Louis's best mates, Singo and Hassan, are into basketball and skateboarding, and his dad is into arm-wrestling. Dad wants to build Louis up with wrestling moves like the Walls of Jericho or the Five Star Frog Splash, but Louis is better at flexing words than flexing his muscles.This summer Louis is put to the test, starting with the Phenomenon. As soon as I started this book, I though that it may prove very popular with young male readers...there is loungeroom wrestling and noxious flatulence in the first few pages! A little way further into the book, I was happy to realise that there's a bit more too this story than smelly boy stuff. Louis lives with his Dad and sister Rosie, his mother died when he was 18 months old. While Louis's Dad is obsessed with wrestling moves and making sure that Louis is prepared for everything, Louis is much more interested in spending time with books and words. His friends are also interested in different things, and Louis starts to feel their friendship changing/..and then there's the 'incident'. 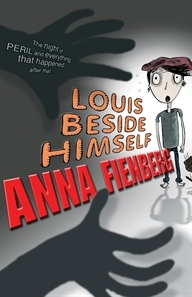 The incident is where Louis finds out what it means to be beside yourself, because this is how he feels when he comes face to face with an intruder in his house. The intruder actually turns out to be Cordelia, who is running away from some family problems. Easy fixed, Louis and his mates invite her to stay in a tent in the backyard...of course. There are a lot of funny moments in this book, but to me it’s quite a sad story. Poor old Louis started off knowing that he was different to his friends, so he deals with that, even when the three boys start to go off and do their own thing. When his Dad starts to spend more time with Doreen, Louis finds himself spending more time at home alone. All he really wants is someone to talk to him about his Mum and to give him the occasional cuddle, and his Dad is more interested in wrestling, and now Doreen, than cuddles. Cordelia is an interesting character, she is older than Louis, but she is the only one that understands his love of words. Cordelia may have fallen out with her Mum, but she still has one, and that’s one more than Louis. When he takes it upon himself to reconcile the pair, things don’t go as smoothly as he had hoped. Will words be enough to get him out of a tricky situation? I really liked this book, a story about family, friendship, change, growing up and wrestling! For those of us word loving readers out there, you will be pleased to know there's a treat at the back of the book...Louis Montgomery's Word Bank, where he lists his words, their meaning and synonyms!